People willing to live in these remote villages and help start churches and visit nearby communities to encourage their new churches. Pray that key people in the unchurched villages would be open to forming cell groups of believers that will mature into viable churches. 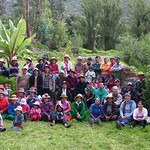 To see churches planted and believers discipled into mature Christians in the Cotahuasi Canyon.